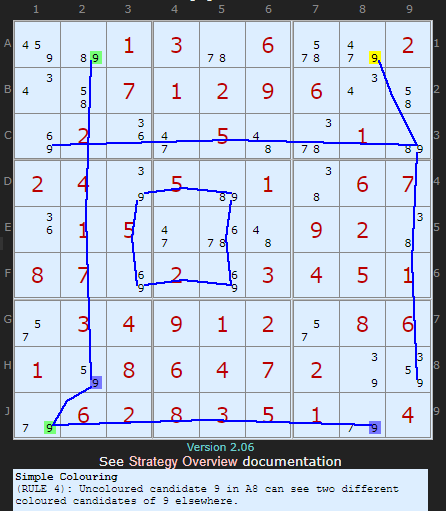 I was using Andrew Stuart's online solver http://www.sudokuwiki.org/sudoku.htm to study a problem I was having and came across something unexpected (and totally unrelated to my problem). Can this be extended to also discard r3c1 & r8c9; since r1c8 is part of a chain and these candidates would have the same colour as r1c8!? Or would discarding r1c8 simply eliminate that 'arm' of the other chain!? speter wrote : Can this be extended to also discard r3c1 & r8c9; since r1c8 is part of a chain and these candidates would have the same colour as r1c8!? In theory you are correct but the point is somewhat moot. Eliminating 9 in r1c8 leaves 9 in r3c9 as a hidden single in Box 3, so of course you can then eliminate any 9's it sees, as well as 8 in r3c9. The colouring move can also be thought of as an X Chain, Turbot Fish, a Kite or an Empty Rectangle, but I don't think Andrew has these last three moves in his solver. Andrew has X-Chains (under the name 'X-Cycles', and including these with Grouped nodes) and Empty Rectangles. Turbot Fish, Kite and Empty Rectangle are all cases of X-Chains. 200e200w wrote: Andrew has X-Chains (under the name 'X-Cycles', and including these with Grouped nodes) and Empty Rectangles. Turbot Fish, Kite and Empty Rectangle are all cases of X-Chains. Actually he doesn't have true X-Chains at all. X-Cycles only cover the Nice Loop variants of X-Chains. It means, for example, that multiple discontinuous X-Cycles are needed to get all potential Skyscraper eliminations (which you would get with a single X-Chain move). The same is true for generic AICs as well (Nice Loops only). Only his XY-Chains and some named patterns work like real chains. I've updated my program's (single chain / simple colouring) rule 4 so it would remove r1c8, r3c1 & r9c8 and set r3c9=9. speter wrote: Thanks very much, everyone. Why would you do that? Only the first elimination is valid for the one and only Simple Coloring move you have available here. The others happen as a direct result of it (through a hidden single move). You can no longer call your move standard Simple Coloring if you mix other effects into it. The same is true if you view it as an X-Chain (a 2-String Kite in this case), which I think is preferable anyway. Only the first elimination (r1c8) is part of the move, and everything else happens after it's actually performed. ...which *then* eliminates 9 from r1c8 and r8c9. ...either of which *then* sets r3c9=9 through a Hidden Single move. In this case, the end result is the same through any of these moves (Simple Coloring, X-Chain::2-String Kite, X-Chain::Skyscraper, either kind of Discontinuous X-Cycle). Personally I'd discard Simple Coloring and discontinuous X-Cycles altogether. X-Chains and their truly looping variants (== continuous X-Cycles) are all you really need to implement for your program, as far as these kinds of single-digit techniques go. Everything else is just unnecessary and confusing clutter. Last edited by Leren on Sun Jan 28, 2018 11:48 pm, edited 3 times in total. I'm pretty sure Andrew doesn't do Skyscrapers. No idea why. First, a Skyscraper is a case of X-Chain (X-Cycle). Second, a Skyscraper is a case of Multi-Coloring (which has been deprecated in Andrew's solver). You're right about the first part -- that Skyscraper is an X-Chain -- but X-Chains and X-Cycles are not the same thing. Andrew's solver only has X-Cycles, hence no Skyscraper functionality (with or without that name). It must use (at least) two discontinuous X-Cycle moves to get all possible eliminations when a Skyscraper-like X-Chain would need just one. Similarly its so called AICs only work as Nice Loops, not as chains, so it may need more such moves than say Hodoku which has true AICs. Only XY-Chains work like real chains in Andrew's solver. ...X-Chains and X-Cycles are not the same thing. Andrew's solver only has X-Cycles, hence no Skyscraper functionality (with or without that name). It must use (at least) two discontinuous X-Cycle moves to get all possible eliminations when a Skyscraper-like X-Chain would need just one. Similarly its so called AICs only work as Nice Loops, not as chains, so it may need more such moves than say Hodoku which has true AICs. Only XY-Chains work like real chains in Andrew's solver. I agree with everything you wrote, SpAce. X-Cycles are like X-Chains, but they only include their Nice Loop variant. His AIC's also include only its Nice Loop variant. Only XY-Chains (which are the case of an AIC) use the full power of an AIC. 200e200w wrote: X-Cycles are like X-Chains, but they only include their Nice Loop variant. His AIC's also include only its Nice Loop variant. Only XY-Chains (which are the case of an AIC) use the full power of an AIC.